Junior Celia Frutos is an exchange student from Spain who has been in the U.S. for the past 3 months here in America. “Being an exchange student is basically great. I love this experience and I will miss it so much. It allows you to have had an opposite view of the world, and opposite view of your life an to meet such incredible an amazing people,” said Celia Frutos Muñoz. Celia is staying with LHS student Kailer Bertram, who is also a junior. “I have been so lucky with my host family. They have treated me like one other member of their family since the first day, they make me laugh all the time and I know I can count on them for everything. It is great to know you will always have a family on the other side of the world”, said Celia. After living three months in the U.S., Celia realized the similarities and differences between Spain and Colorado. “When coming to Colorado from Spain or Spain from Colorado you won’t really notice a big cultural differences, one difference is that we do have beaches in Spain, water surrounds the north, the south and the east coasts of the country, basically most of us are able to go to the beach every year. However, some people I have met in America have told me they have only been to the beach a couple times in their lives, which can be shocking on the one hand, but understandable on the other hand. If you want to go to the beach from Colorado you have to drive or fly for a long time, so it is actually logical. We have mountains in Spain but the mountain views you can see in Colorado are amazing. It is so cool you just need to drive for a couple hours and you are already able to go skiing on huge mountains” said Celia. Throughout her homework and school activities, Celia discovered a few incredible things that surround Colorado. ”One of my favorite things from Colorado so far I would say is how the four seasons can be seen, how the trees can be so beautiful until their leaves fall and it starts snowing, how then flowers and leaves start growing again and it is warm during the summer. It does snow in Spain and it is warm, leaves fall too but I would say you can’t appreciate it as much. If I had to say what my least favorite thing from Colorado is, I would probably pick how everything is so spread out and you need to drive everywhere. You need to drive from your house to school, to the different shopping centers, to the doctor’s, to the grocery store, etc. In Madrid, you can either walk or take public transportation, that is found throughout the whole city in almost every street. I have liked everywhere my host family has taken me to, but the Garden of the Gods was incredible. On the other hand, Andy’s frozen custard is great, my favorite place for sure,” said Muños. Even if Colorado has remarkable places to go and mountains to climb there are still things that Colorado can’t give to Celia like the people of Spain, her family, friends, and obviously the food. “Not only tapas, what everyone thinks we only eat in Spain, but paella, cocido, tortilla de patatas, jamón serrano, calamares, migas, croquetas, fideua, lentejas, pescado…” said Meñoz. Celia Frutos’ goals were to learn about Colorado’s culture, people, and its education. “I have learned how people can be so different and so similar at the same time, how Americans’ life and what their opinions and thoughts are referring to specific stuff. I have learned about how they live and what they usually do, how their school system works, about their timetables and so much more. I have learned a lot while being an exchange student, and I hope I will a lot more throughout the months I have left,“ said Celia. 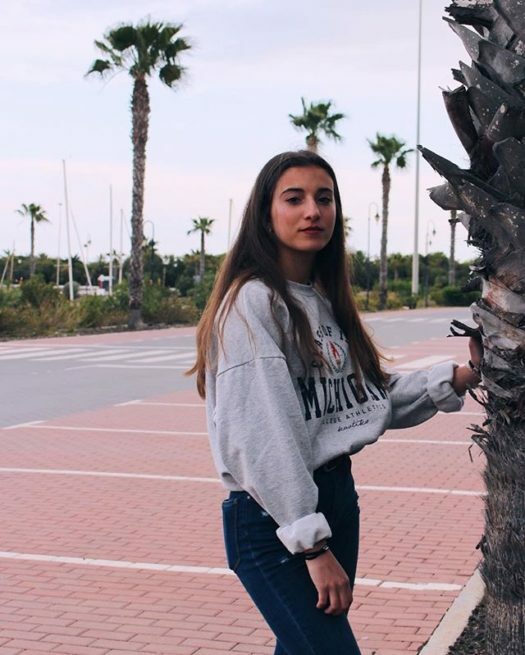 With her confidence and comforting presence, and the way she always wears a nice smile on her face in the morning, Celia Frutos Muñoz has her own way of bringing joy into peoples’ lives.